Though one does not tend to give a second thought while packing luggage for train journeys, there are many rules that one need to know of. More so, when there are NEW rules which needs to be adhered to. 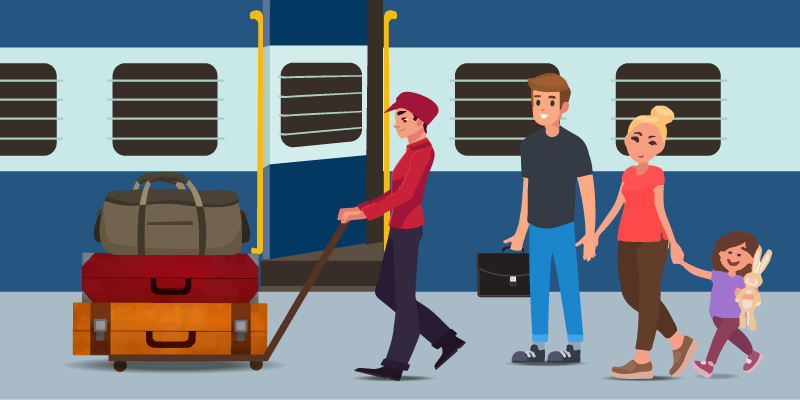 Clutter is always been a big issue in trains and these Indian railways rules aims at creating a pleasant experience by limiting luggage on trains. So, much like the airlines operators, Indian railways has also decided to limit luggage weight for their passengers. Since the late 1980s, Indian railways has a rule in place for permissible luggage carrying weights. But with the wane of time this rule somehow fell into disuse. As a result luggage overloading has become a popular feature of Indian long distance railway coaches. One has to understand that there are only a limited number of luggage stacking places in any Indian train coach and when one passenger carries a lot of luggage, immediately another passenger has to suffer. This is why Indian railways have decided to set limits per passenger and this time they have promised that the rule would be followed stringently. As a part of tracking excess luggage, the railway officials would set up check-points at all major railway stations across India. AC First Class passengers can carry 70 KG luggage for free and a maximum of 150 KG by paying for the extra weight at the parcel office. The marginal allowance on the luggage weight would be 15 KG. AC Two Tier passengers would be allowed 50 KG luggage for free (with marginal luggage weight allowance of 10 KG) and they can carry a maximum of 100 KG by paying for the extra weight at the station’s luggage/parcel office. Passengers travelling in AC III or AC Chair Car can carry a luggage of 40 KG for free (with marginal luggage weight allowance of 10 KG) and they would be permitted a maximum carrying limit of 40 KG. 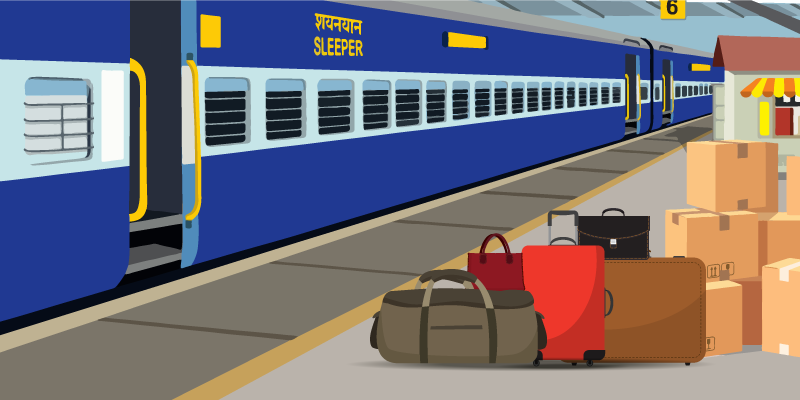 Sleeper class passengers would be allowed a luggage weight of 40 KG for free (with marginal luggage weight allowance of 10 KG), and a maximum quantity of 80 KG weighing luggage can be carried after paying for the excess. Passengers in the Second class would be allowed a maximum luggage weight limit of 35 KG for free (with marginal luggage weight allowance of 10 KG). They can however carry a maximum of 70 KG by paying for the excess luggage at luggage/parcel office. Children aged between 5 and below 12 years would be allowed only half of the free luggage allowance for their respective class. The free allowance in such instances cannot exceed 50 KG in weight. Railways has also defined the dimensions for personal luggage. 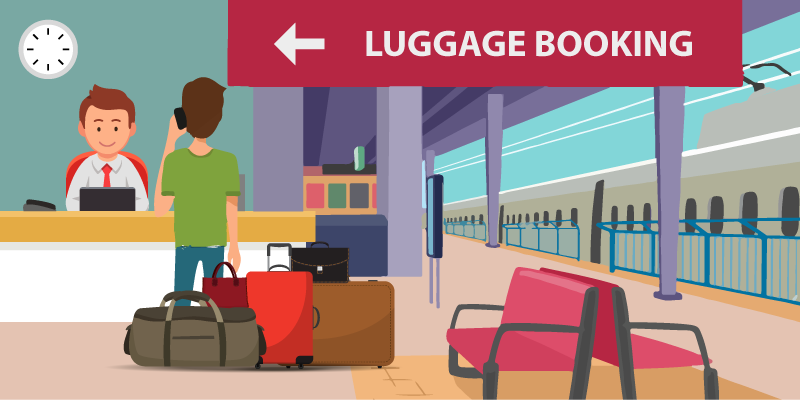 The trunks, suitcases or boxes that you carry in the train should be within the prescribed measurement of: 100 cm x 60 cm x 25 cm (length, breadth, height). Luggage exceeding these measurements would be send to the Luggage van (even if they are within the free limit). How to book for extra luggage? Fill in the declaration form for extra baggage and get it weighed. Pay the difference in fare and get the slip certifying the booking of extra luggage. This slip should be kept close by and shown to the TTE when needed. Once booked, the extra luggage would be sent to the brake van. The extra luggage cannot be carried along in the regular train compartment. NOTE: Minimum charges for extra luggage bookings start from INR 30 upwards (depending on the weight of the luggage). 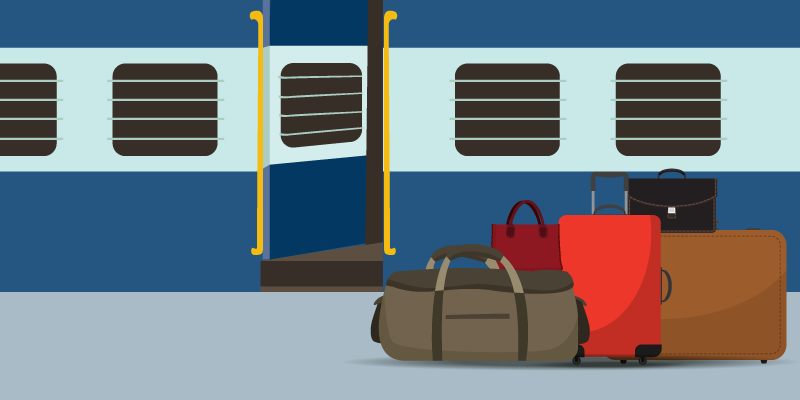 What type of common luggage are not permissible on Indian trains? There are certain items that you cannot carry on the train, and there are some others which you can only carry with prior permission. You all know that explosives and inflammable items cannot be carried in a train. Similarly, any commodity having acid or inflammable gas content or deemed dangerous for the well-being of the co-passengers cannot be carried on trains. Oxygen cylinders with the supporting stand can be carried by patients in all classes. But medical certificates need to be furnished for such a privilege. The oxygen cylinder along with its stand, when allowed, would be part of the free luggage allowance. No merchandised items are allowed as a part of the personal luggage. You need to seek special booking for these and they have to be carried in the Luggage Van. Offensive or derogatory items carried by the passengers, which hurts the sentiments of the co-passengers can also be treated as a violation of the luggage carrying code. Birds, fishes, dogs or cats are not allowed within a train’s coach. You have to get a booking for them in the Parcel office. The only other way is to book an entire AC First Class coupe. We hope we have been able to clear the air around many new and unknown Indian railways luggage rules. Next articleComplete Puri tour in 48 hours! 5 Scenic train journeys in Northeast, you should definitely plan! Wheels of Purpose: 5 trains of difference in India! It was all over news a few days back but after criticism it was rolled back in a day or Two. Don’t think it still applies. Al though these rules have been there for long it was never inposed strictly. After criticism, it may continue to be the same case. India railways are thinking like the flight operators while implementing these new luggage rules. But they should be more concerned about the regular delay of trains. Then again, if you lose luggage in Indian train, what do you get in return? Nothing. Indian railways should think about their duties before applying such new rules on passengers. It will increase the travel time. Secondly, if you lose a luggage, forget compensation, it will take your lifetime to prove you had booked your luggage. Will the train stop at stations for a passenger to collect excess bags from the luggage van? Long distance express trains do not have more than a couple of minutes stop at wayside stations! When the train reaches a station at odd times, would there be someone in the luggage van to collect the bags from? Apart from this, luggage vans are situated near the AC first class coach. If a passenger gets down from a coach on the other end of the platform, he might even struggle to reach the luggage van before the train starts moving again. The Indian railways should think about these practical problems before implementing a new rule. I agree with Sumit Bhalla’s comments. The above rules are strictly followed by the indian railways.i aggred with the above article. Senior citizen word is self explanatory. Therefore while allotment of berth to a senior citizen lower berth should be considered without fail and there should be no unnecessary harashmemt for humanitarian point of view. Because they are respected persons of our society.